After defeating Pinecrest 12-11, the Bloomingdale Huskies became 2011 District 13 TOC Champions. Following a tough season plagued with some injuries, the Bloomingdale Huskies (13-4) little league senior softball team managed to pull together and win the 2011 District 13 Tournament of Champions (TOC) by defeating Pinecrest 12-11, held at and hosted last month by the at Pinecrest Little League, located at 9312 C.R. 39 S. in Plant City. Moyer’s comments about the girls’ endurance and not giving up could not have been any more true during the team’s final TOC qualifier Bloomingdale League game, which the Huskies won thanks to a last inning rally. “We had seven runs in the top of the seventh inning and turned the game around by winning it 14-11, which also allowed us to qualify for the TOC,” Moyer said. During the double elimination TOC tourney, the Huskies defeated Pinecrest first at the start of the game and during the final game of the event. According to Moyer, the win was extra special since the team had been beaten by Pinecrest twice during the regular season (22-0 prior to the TOC). “We knew that it would be a tough competition and that we would have no room for errors if we wanted to win,” he said. While proud of his team, Moyer spoke highly of a number of players that stood out this year, including 14-year-old Emily Harrell who, due to injury, sat out for five weeks prior to the TOC, yet played like champ during the tourney. 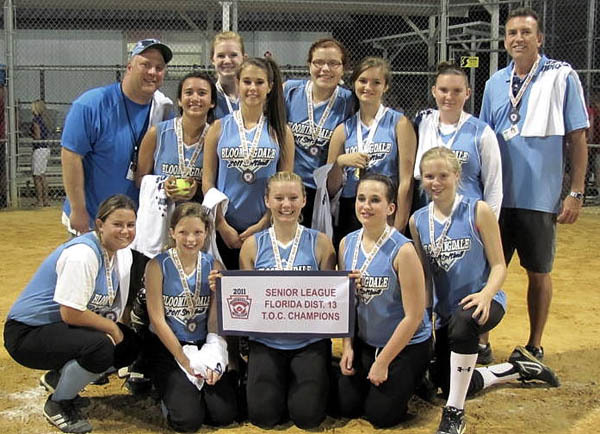 Allison Gwynn, 15, also played a major part in the team’s success, including hitting a double to win the Bloomingdale League. Moyer also mentioned Taylor Shaw, who pitched the first three innings against Pinecrest in the final, giving up three runs. At the end of it all, Moyer said that, besides winning the TOC trophy, the best thing about this year’s season is the positive attitude. For more information about the Bloomingdale Huskies, please visit www.bllfl.com.